They are accused of being behind the 1993 assassination of the country's first elected Hutu president. Mr Buyoya, an ethnic Tutsi, says it is a ploy to stir up divisions and shift attention from the current crisis. Mr Buyoya - who has seized power twice in the last three decades with the backing of the army - is a respected diplomatic figure on the continent. 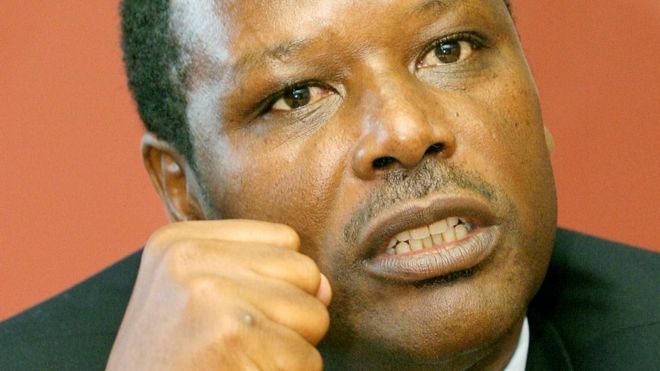 He was involved in the peace process that ended the civil war and led to the election, in 2005, of former Hutu rebel leader Pierre Nkurunziza as president. The current unrest in the country was sparked by Mr Nkurunziza's decision to run and win a third term in office in 2015. "I was astonished to learn about the serious accusations clearly intended to undermine my honour and integrity," the 69-year-old, who is now the AU's special envoy to Mali, said in a statement. He said the case of Mr Ndadaye's assassination, which took place four months after the country's first democratic election, was the subject of much debate during the mediations to end the war. The subsequent peace agreement, known as the Arusha Accord and signed in 2000, was intended to reconcile these blood feuds and bring reconciliation, he said. But by issuing of the arrest warrants, the government was using "diversionary tactics" for electoral purposes, which risked plunging the country into ethnic conflict, he said.